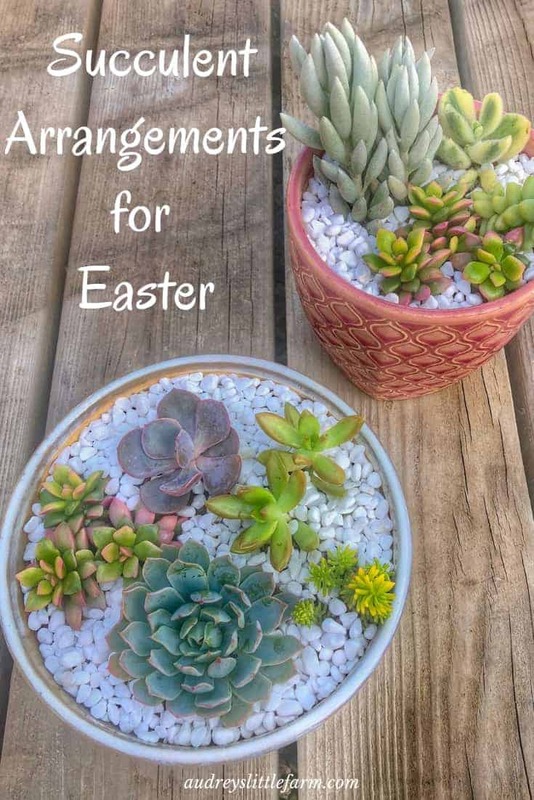 With Easter coming up soon there is no better gift to give or way to decorate than with beautiful Easter inspired succulent arrangements. Succulents are amazing plants! There are ones that thrive indoors and outdoors, and they are drought tolerant! I also love that there are sooo many varieties. Every time I go to the nursery I usually end up coming home with a few more because I find one that I don’t have yet. The other great part about these amazing plants is that you can use them in arrangements for every holiday. I have made Christmas themed succulent arrangements, Valentine’s Day, Fall, Mother’s Day, and now Easter. So each time a holiday is coming up I come up with a succulent arrangement to represent the holiday and they always turn out great! Plus once the holiday is over the succulents continue to grow and so you don’t have to get rid of the arrangement. So since these succulent arrangements are so fun and easy to make I want to show you how you can do it yourself! The great thing about making your own succulent arrangement for Easter is that you can be as creative as you want! I kept my arrangements pretty simple because I wanted them to still fit in after Easter passes. But that doesn’t mean you should worry about that. You can always repot your succulents or take away the pieces that really make it themed for Easter. My main focus was using pots that were light colors to represent the holiday like pinks, whites, and light green. Then I only used succulents that were light pastel colors or that had purple and pink colors. And if you aren’t familiar with succulents, that will be super easy! There are a ton of succulents that have pink and purple. In fact, when I was at the nursery last, I came across these pots and automatically thought they’d be perfect for Easter. Then I shopped through their succulent selection to find the perfect Easter succulents. I ended up finding quite a few but my favorite were these ones in front! They are green and pink and I knew instantly that they would look great! Plus they were pretty unique! All of the other succulents in this pot I thought fit the Easter theme pretty good as well. So now that you’ve got your pot and succulents, lets get to how we put it together! Find an Easter themed container. This could be light colored pots like I showed above. An actual Easter egg shaped planter . Or an Easter egg basket lined so your soil doesn’t fall out. But you can really use anything that you want to. You can get super creative or just go with a regular garden pot. Pick out light green, pastel, pink, and purple succulents. These are all great Easter colors and will be what really gives your arrangement the Easter feel. Some great places to find succulents are your local nursery, online at Mountain Crest Gardens, or if you have a Costco check there. Our Costco only get succulents in seasonally but they are the absolute best price of anywhere around! Fill your container with succulent soil about 2/3 full. If you’d like to make your own soil check out my post homemade succulent soil. 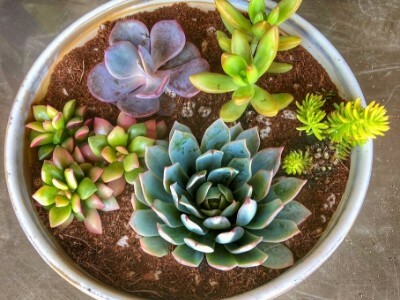 Then take all of your succulents out of their plastic containers and remove all the soil from around their roots. 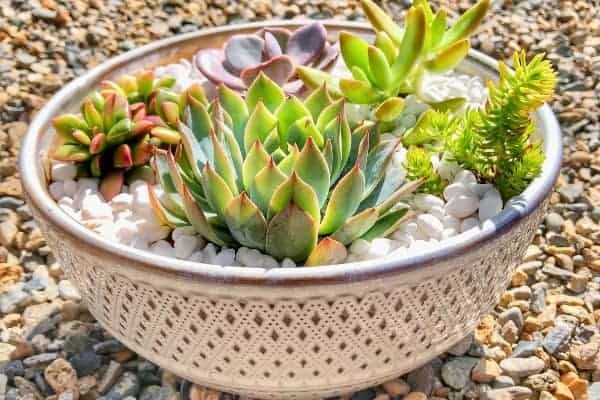 Now place your succulents in the soil where they look best. 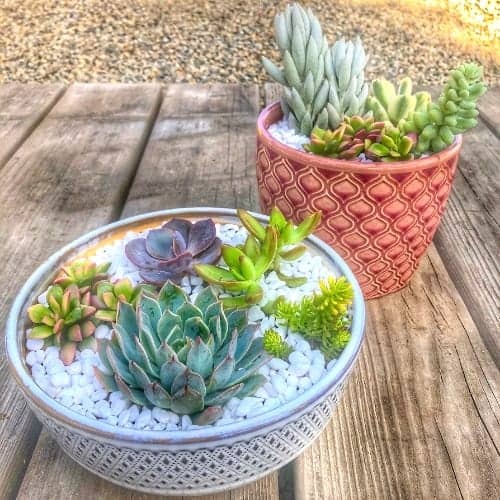 If you have 1 or 2 larger succulents I typically place one near the front of the container, or off to the side and then fill around with smaller succulents. Once you have them set where you want, one by one fill in around them with soil. I prefer to add one succulent in at a time because then less soil gets on the other succulents. Pick out a material to add on top of the soil. I used white decorative rock, but you can use any color rock that you prefer or something different such as moss. Then fill in all around your succulents so all of the soil is covered. 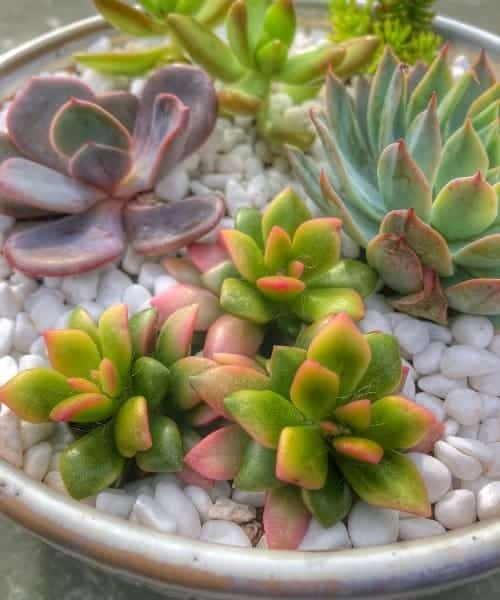 This simply adds a nice finish and helps make the succulents stand out. Right after you create your arrangement, be sure to wait at least 4-5 days before watering. When succulents get repotted their roots have to calluce over before receiving water. 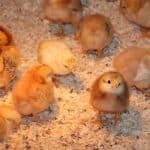 Then depending on what type of container you used will determine on the care needed. If you are using a pot be sure that it has a drain hole in the bottom. If it doesn’t then check out 3 Easy Steps to Drill Drain Holes in Ceramic Pots. 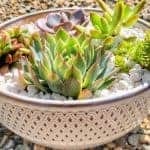 For succulents to continue to stay healthy they will need good drainage and proper lighting. But if you used a container that looks cute for Easter but doesn’t have drainage don’t worry. Just keep the arrangement for the few weeks around Easter and then repot the succulents into a container with drain holes. You can also keep your arrangement indoors for a few weeks without worrying about light requirements. But after a few weeks be sure that you place your arrangement in a bright window or outside where they will receive sun with partial shade as well. Most succulents cannot handle fun hot sun, or complete shade. So to be safe keep the arrangement somewhere in the middle. Then be sure to not over-water. Succulents are easy plants because they don’t require much care. Typically when succulents die it is from over-watering, not under-watering. So once a week give your arrangement a thorough watering, but be sure that the soil is drying out in between. 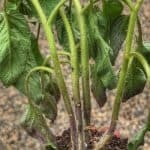 If the soil is still moist you can give a couple extra days in between waterings. Whether you are making this arrangement for yourself or for somebody else, I hope you have fun creating your very own Easter inspired succulent arrangements! There’s no need to buy a gift from the store when you can create something just as beautiful on your own!